Fragrance Free Fridge-It® Cubes odor eliminators are ideal for even the worst odors in refrigerators and for providing fresher tasting and odor free ice in the freezer. The activated charcoal works on all odors, not just the easy ones. Patented advanced air flow design and activated charcoal filter literally pulls odors into the filter and TRAPS them. Odors are effectively removed so that your food is fresh and free from any 'cover up,' fragrances. 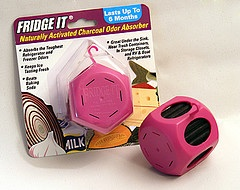 Fridge-It® uses nature's best odor-adsorbing material - CHARCOALl! A patented porous process then activates the charcoal enabling it to target and neutralize odors. Fridge-It® also provides a more convenient way of odor control without the mess of spills and clean up. Just place one in the refrigerator and one in the freezer for amazing results. Not only is Fridge-It® great for the refrigerator and freezer, it also works well in other relatively small contained areas - closets, pet areas, lockers, gym bags, coolers, near garbage, diaper pails. Get RID of your odors, don't just cover them up! For LARGE AREAS please consider other products.